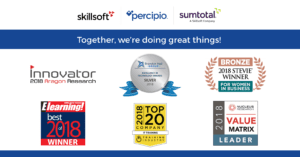 BOSTON – December 13, 2018 – Skillsoft and SumTotal today announced seven new award wins, bringing the total number of awards and accolades for their corporate learning and Human Capital Management products, customers and executives in 2018 to more than 30. Recently, Aragon Research, Brandon Hall Group, Elearning! Media Group and Training Industry recognized the companies’ original products. In addition, Nucleus Research ranked SumTotal a Leader in its Talent Management Technology Value Matrix 2018. Further, Chief Marketing Officer Tara O’Sullivan was recognized for her leadership prowess at the annual Stevie® Awards for Women in Business. Most recently, Skillsoft and SumTotal won the Aragon Research 2018 Innovation Award for Learning. The Aragon awards recognize providers’ visionary uses of technology not only to adapt as markets change but also to help inform how their markets evolve. The Innovation Award acknowledges the ability of Skillsoft’s content solutions and Percipio learning experience platform as well as SumTotal’s Learning Management System to help organizations achieve success while delighting learners with consumer-inspired designs. Prior to that, Skillsoft and SumTotal were both recognized with Brandon Hall Group 2018 Excellence in Technology Awards. Brandon Hall Group’s awards acknowledge vendors’ design, functionality, usability, and overall measurable benefit to organizations. Percipio won Silver for Best Advance in Emerging Learning Technology, and SumTotal won Silver for Best Advance in Integrated Talent Management. Meanwhile, Skillsoft’s Technology and Developer portfolio was named to Training Industry’s selection for the 2018 Top Training Companies™ list for the IT Training sector of the learning and development market. Selection to the 2018 Training Industry Top 20™ IT Training Companies List was based on Skillsoft’s breadth and quality of IT training content and courses in addition to its leadership and innovation in IT training. Elearning! Magazine readers voted SumTotal Learning Management Best of Elearning! The Elearning! Media Group’s user’s choice awards honor exceptional applications across the learning and technology marketplace. Either Skillsoft and/or SumTotal has earned a Best of Elearning! award in each of the program’s 14 years. Similarly, Nucleus Research positioned SumTotal as a Leader in its Talent Management Technology Value Matrix for the fourth consecutive year. The Nucleus Research Technology Value Matrix provides a transparent means to help businesses quickly assess a variety of technology solutions based on functionality and usability. Vendors that are positioned as a Leader tend to offer technology that is both highly functional and easy to use. Nucleus cited SumTotal’s success consolidating talent acquisition, learning management, talent management, and workforce management into a single integrated platform as a key strength as organizations increasingly look for an integrated view of talent. Lastly, Tara O’Sullivan, Skillsoft’s chief marketing officer, won a Bronze Stevie® Women in Business Award in the Women Executive of the Year – Business Products – 11 to 2,500 Employees category. The Stevie Awards for Women in Business honor female executives, entrepreneurs, employees, and the companies they run – worldwide. The Stevie Awards recognized Tara for her success in leading Skillsoft’s and SumTotal’s global marketing, content and corporate social responsibility (CSR) initiatives as well as for her efforts as a strong advocate for women in business. Tara was also a finalist for this year’s Aragon Research Women in Technology Awards and the Irish Women in Business Awards. For a comprehensive list of Skillsoft’s and SumTotal’s awards, visit www.skillsoft.com/about/awards/ and www.sumtotalsystems.com/awards/.